Fishing, sailing, windsurfing, paddlesports, rafting, swiming or the excitement of gorge walking are all within easy reach of many of Sutherland’s. 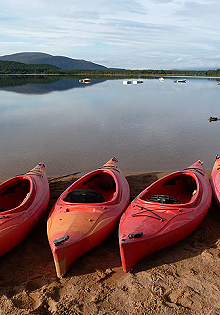 The Cairngorm National Park boasts two dedicated watersports centres, Loch Insh and Loch Morlich. Each has its own individual character and features but both are unsurpassed by the stunning beauty of their natural surroundings. Viewing wildlife from the water is a great experience, whether from the intimacy of an open canoe or the comfort of a specialist craft. Loch Insh near Kincraig and Loch Morlich near Aviemore are ideal places to see many types of wildlife in their natural environment.